The Bridgeport Rig was patented by Louis S. Flatau of Pittsburg, Texas in 1882 and manufactured by the Bridgeport Gun Implement Co., of Bridgeport, Connecticut. 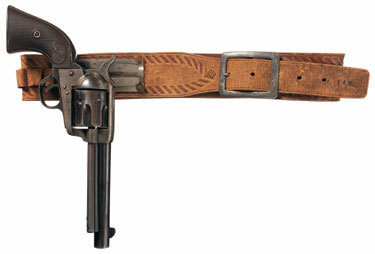 One’s Colt Peacemaker could be drawn quicker by simply sliding it in a straight line forward from its clip, and it could even be fired potentially faster still by leaving it attached and just swiveling the gun. I’ve heard of this before, but Fred Sinclair has some details I didn’t know. Apparently, they actually sold 500 of the rigs to the US Army. It’s not hard to see that soldiers wouldn’t like them. A Bridgeport Rig could be just the thing tucked away under your long coat for a night gambling in the town saloon, but it would be a trifle insecure, bouncing around on top of a horse, and for field duty you’d want a holster with a flap, not an arrangement that left your expensive revolver completely exposed to the weather. Elmer Keith wore a Bridgeport rig as did James Gillett when he was Marshall of El Paso, Texas in the 1880s; it is sometimes referred to as the “Gillett Rig” for this reason. 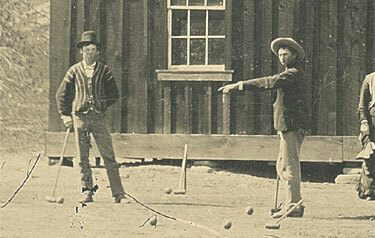 Young man identified as Billy the Kid (on left) playing croquet with other regulators, Summer 1878. Taken just one month after the tumultuous Lincoln County War came to an end, it offers a rare window into the lives of these gunmen. Rather than a threatening outlaw, Billy the Kid seems to be enjoying some downtime following… a wedding. Amy Athey McDonald, at Yale News, describes Wild Bill’s first gunfight, and shows us a revolver once owned by Hickok, now in Yale’s Peabody Museum collection. 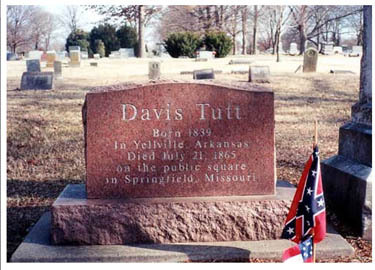 Davis Tutt shouldn’t have taken Wild Bill’s watch. The former Confederate soldier and gambler was shot down by James Butler “Wild Bill” Hickok 150 years ago in Springfield, Missouri, in what is today recognized as the first quick-draw gunfight of the American West. 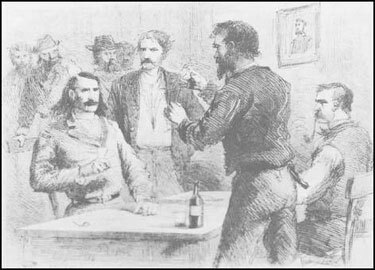 Events leading up to the legendary shootout began the night before with a dispute over a gambling debt. Hickok and Tutt had known each other for years, but there had been a falling out and Wild Bill refused to play cards with Tutt. According to an account by a witness who called himself “Captain Honesty,” Tutt retaliated that evening by giving money to every other man around the table playing against Hickok. A successful gambler, Wild Bill won nearly $200 that night, which angered his one-time associate even more. Tutt called in a past debt of $45 on the spot from Hickok, who promptly paid up. Tutt then claimed another $35 debt owed from a previous game. Hickok disagreed with this second claim, saying he only owed Tutt $25. It was at this point that Tutt took Hickok’s gold Waltham watch from the table and said he would keep it until the debt was paid. Hickok warned Tutt against such a foolish action. Trial testimony from a J.W. Orr noted that Tutt later raised his price to $45. While the details of what happened the next day on July 21, 1865, are not entirely clear, historians agree that Tutt showed up in the town square in front of the courthouse around 6 p.m. with Hickok’s watch. Wild Bill appeared at the other end of the square and warned Tutt not to come any further. The two began to cross the square toward one another, drawing their pistols. Exactly how far apart they were and what guns were used are not definitely known. It’s written that they were facing side-on, dueling fashion, almost 100 paces apart, with Hickok using his Colt Navy. Tutt and Hickok fired one shot each. Tutt missed; Hickok didn’t. 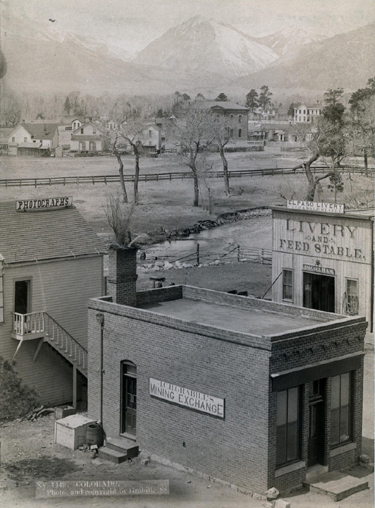 Tutt staggered and fell, shot through the heart, and Hickok was soon arrested and charged with murder. The charge was later reduced to manslaughter, but the jury found that Hickok acted in self-defense and he was acquitted. The shootout launched Wild Bill’s fame as a gunman. French .44 Pinfire Revolver of unknown manufacture, presented by James Butler Hickok to Wild West Show manager William Green, Yale Peabody Museum. 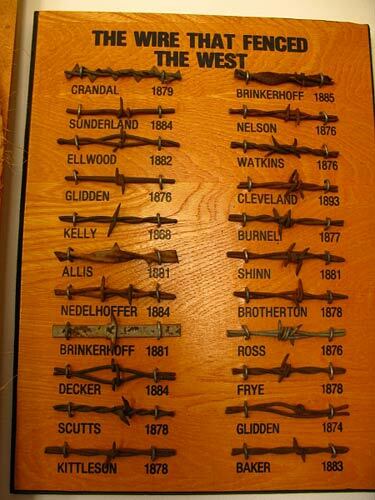 How the West was Fenced – Like a cattle-brand, local family ranches in the late 1800’s made their own barbed wire and used it to identify their property lines and retain their stock. What’s a good indicator that you’re a badass..? Making your own barbed f’n wire! 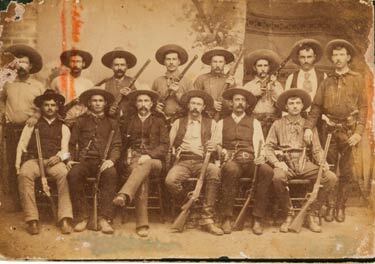 The hardy bastards probably flossed their teeth with it too..
Heritage Auctions is selling the original cabinet card photo of this iconic Western image from the John N. McWilliams Texas Ranger Collection on September 20th in Dallas. Back row from left: Jim King (murdered while working undercover February 11, 1890), Bass Outlaw (discharged 1889, killed by Constable John Selman in El Paso April 4, 1894), Riley Boston, Charles Fusselman (ambushed and killed by rustlers April 17, 1890), James William “Tink” Durbin, Ernest Rogers, Charles Barton, Walter Jones; Sitting (from left): Robert Bell, Cal Aten, Captain Frank Jones (Killed in a fight with Mexican bandits near San Elizario, Texas, June 30, 1893, Joseph Walter Durbin (retired and became sheriff of Frio County), Frank L. Schmid Jr. (died June 17, 1893 of gunshot wounds received August 16, 1889 in Fort Bend County when caught in a crossfire between two hostile political parties). 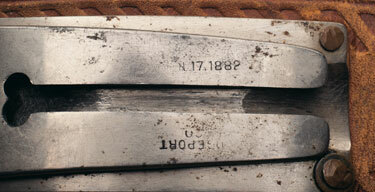 Winchester and Colt Model 1873s seem to be the universal choice. The mortality rate from gunshots for members of this small group of men was pretty impressive. Five out of fourteen (four on the right side of the law) were dead with the next seven years. 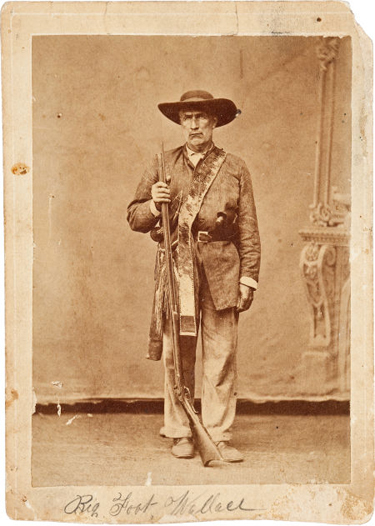 The highlight of Heritage Auctions’ upcoming March 1-2 “Texana” sale seems to be an albumen photograph dating from 1872 of the famous veteran of the Texas War of Independence and the Mexican War, Indian fighter, and Texas Ranger “Bigfoot” Wallace. Bigfoot Wallace appears in the Larry McMurtry novel Dead Man’s Walk, later made into a movie in which Wallace was played by Keith Carradine. 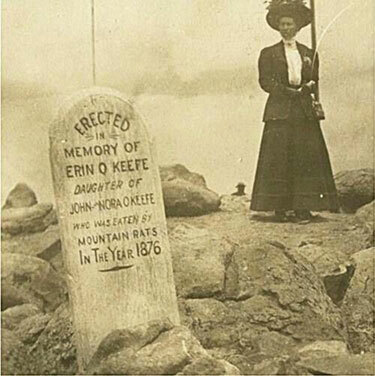 It’s interesting to note that, as late as 1872, the legendary frontiersman is found leaning on a percussion lock long rifle. No Spencer repeater or Model 1866 Winchester for him. Wallace is also packing some unidentifiable large pistol in a covered holster, facing forward on his left hip. He looks like a tough hombre. 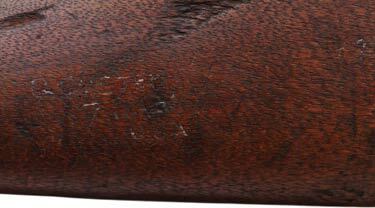 The undoubted highlight of the sale is George Armstrong Custer’s personal Spencer repeating carbine, bearing his name scratched on the buttstock, and frequently mentioned in his accounts of hunting. The bidding starts at $50,000; but, even with recession clouds still lowering over Obamistan, it will probably go much higher. [T]he Spencer carbine offered here pre-dates his Fort Abraham Lincoln period, it does date from the Indian Wars, and could quite possibly have been with him at the Battle of Washita. Dr. Frost purchased the carbine in 1955 from Howard Berry. A notarized bill of sale describes the gun in detail. In a 1973 letter (a copy of which is included in this lot), Frost refers to purchasing various Custer items from Berry, whom he describes as “a former 7th Cavalryman”. Frost states that he showed them to James Calhoun Custer (a nephew of Gen. Custer and son of Nevin Custer), and that Custer assured him he remembered these items which had been shown to him by his father who stated that they were the General’s. Custer used a wide range of military and commercially available firearms over the course of his career, but he had a special familiarity with Spencer carbines. During the Civil War his Michigan regiments were armed with Spencers (Carbines of the U.S. Cavalry, John McAulay, p. 32). As the war ended, a new Spencer model was issued to the army with a more powerful 56-50 cartridge (Spencer Repeating Firearms, Roy Marcot, pp. 80-81). When the 7th Cavalry was formed in 1866 (Bugles, Banners and War Bonnets, Ernest Reedstrom, pp. 1-2), the Spencer Carbine became standard issue (Carbines of the U.S. Cavalry, p. 88), and was in use by them until replaced by the Sharps carbine in 1870 (Carbines of the U.S. Cavalry, p. 95). In his 1980 book, Nomad, George A. Custer in Turf, Field and Farm, Brian W. Dippie reproduces an 1867 article written by Custer in which he describes in great detail a buffalo hunting expedition. He describes learning that pistol shots “only seemed to increase (the buffalo’s) speed.” Accordingly, Custer wrote, “I concluded to discard the use of my revolvers and trust my Spencer carbine” (p.117). The example offered here, serial #3658, is the 1865 model and should not be confused with the Spencer rifle gifted to Custer in 1866; that gun has never surfaced (Spencer Repeating Firearms, p. 152). The presentation gun would have been the 56-44 sporting model. 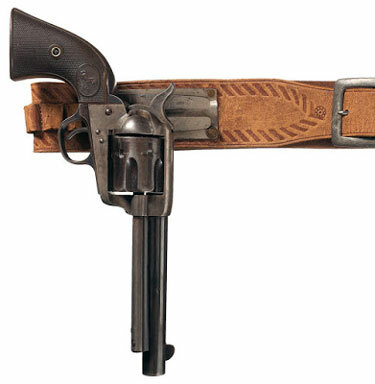 Custer’s regard for his Spencer carbine is evidenced in his own words in his autobiography, My Life on the Plains, where he writes: “Leaping from my bed I grasped my trusty Spencer which was always at my side” (p. 77). “G. Custer — 7 CAV, USA” cut into buttstock. 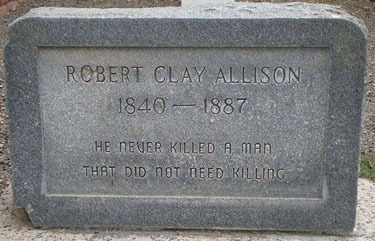 the Archives of Never Yet Melted in the 'Old West' Category.